2018 marks an important landmark for the Brianna Fund as it celebrates its 20th anniversary. Begun in September 1998, the Brianna Fund works to assist children with physical disabilities by eliminating barriers of access to community resources. This work is supported in part through the funds raised at the annual Rev. Dr. Martin Luther King Jr. Benefit Gospel Concert that is held at the Evangelical Covenant Church located at 915 Plumtree Road. This year, the concert, marking their 20th anniversary event, will be held on Saturday, January 13th beginning at 6 PM. The doors will open at 5:30 PM. 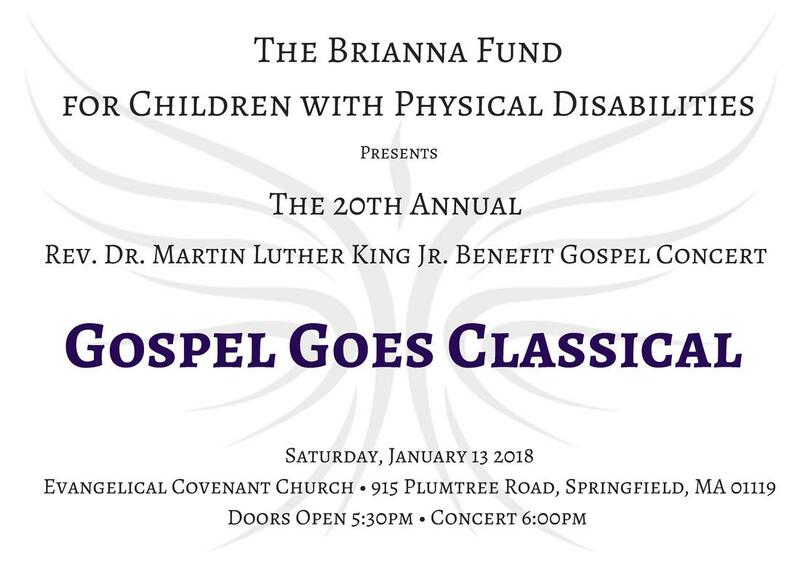 The concert is held on this weekend to coincide with the birthday of Dr. Martin Luther King to honor his vision of looking into the the heart of a person by increasing the awareness of the community concerning the great needs and potential future significant contributions of children with disabilities. Each year, 100% of the proceeds raised through a free will offering taken during the concert go to assist children and their families by funding access to such needs as home modifications, vehicle acquisition and diverse adaptive equipment. In 1999, Brianna Johnson, for whom the fund is named, was the first recipient and symbolizes the mission of the Brianna Fund of hope, flight and freedom as she is now a successful college graduate and professional woman who travels internationally for her job. Her hard won strides come with the support and encouragement of those around her and vital access to the tools that gave her the wings to follow her dream. Every year since, the Brianna Fund has made a substantive difference in the lives of children and their families. They have raised funds to support 47 children. In addition to awarding funds to families in need, the Brianna Fund recognizes a community member for their commitment and service. The 2018 Community Service Award recipient will be Denise Mari Stewart. Denise is the owner of Dom Dee Photography and A Master Plan 4u as well as the trusted Sunday morning voice of WTCC. 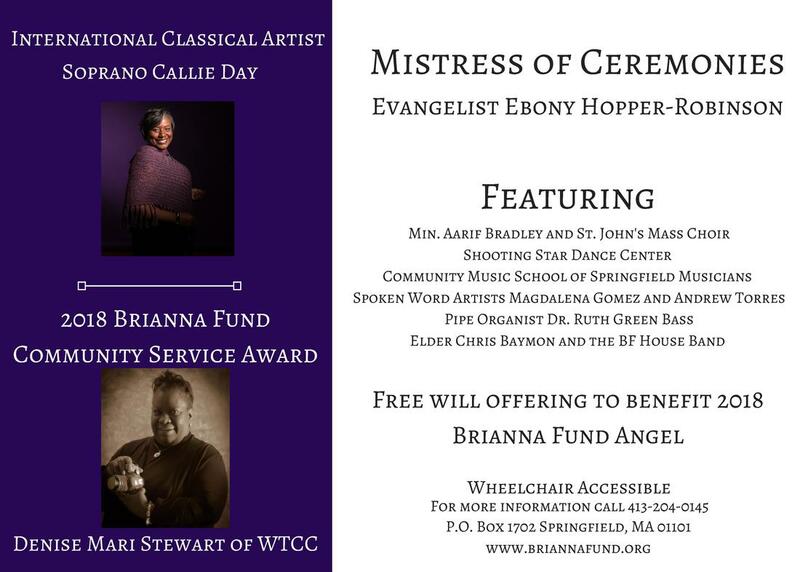 She is deeply committed to her community and uses her radio program as a platform through which to keep the community informed.The theme of this year’s concert will be slightly different from prior years as it will combine gospel with classical music, hosting a performance by internationally acclaimed classical artist soprano Callie Day. The concert will also feature Minister Aarif Bradley and St. John's Mass Choir, Shooting Star Dance Center, Community Music School of Springfield Musicians, Spoken Word Artists – Magdalena Gomez and Andrew Torrez, Elder Chris Baymon and the BF House Band. Guest will arrive to the sounds of pipe organ music provided by Dr Ruth Bass- Green.The evening promises an uplifting community sharing and the important opportunity to support those special, often unseen, needs of your friends and neighbors.